How to Make Saffron There are 3 products. The very best saffron in the World is produced in Iran and has been sincemany centuries, legendary in the precious persian spice like gold. Here is how to make saffron spice which is a comples and labour intensive process involving all hand picking and hand separation as machines would crush the so delicate stigma filaments that occur 3 per single crocus sativus flower the spice is from. Here is how to make saffron tea which is a delicious and most healthy drink you can try to have a sip on in the comfort of home, why not have a go at it all you need is normal black tea of your choice plus some saffron filaments which you can obtain easily online and buy the best get always the best as otherwise you are selling yourself short and missing out on the best quality spice in the World, so why not try some organic ISO certified (internationally accredited) sargol, this is the best cut of all red filament with most colour power and strongest flavor, for this reason it is most valuable cut and treasured by chefs and the saharkhiz saffron is also used in medicine this cut as it has most active chemical drug in it. The finest saffron in the WOrld is produced in Iran by Saharkhiz family famous since 1932 for their finest quality grade 1 sargol seasoning. 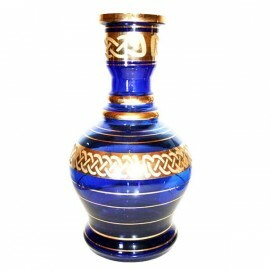 KM Jumbo vase in blue and gold. 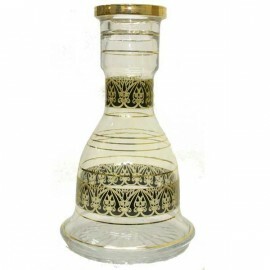 This is a special limited edition Khalil Mamon hand made and hand decorated jumbo vase. 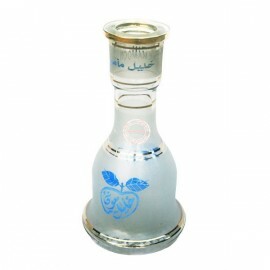 KM classic hand blown blue apple vase. Replacement vase for your Khalil Mamoon pipe.